With total ad sales sliding 5.1% in the third quarter of this year, newspapers have set what must be some sort of record in the annals of American business by having their primary revenue stream fall for 25 quarters in a row. In 75 months of unremitting declines, the industry’s consolidated advertising sales have plunged from an all-time high of $49.4 billion in 2005 to what I estimate will be no better than $22.5 billion in 2012. The year-end revenue projection is based on historic trends. 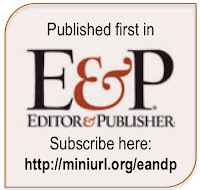 It is a testimony to the legendarily high operating margins of the industry and the considerable cost-slashing skills of contemporary publishers that nearly all the newspapers in business in mid-2006, when the trouble began, are still plugging along today. But no industry ever cut its way to success. And the question, as newspapers mark six-plus straight years of contracting revenues, is what, if anything, they are going to do to turn things around. 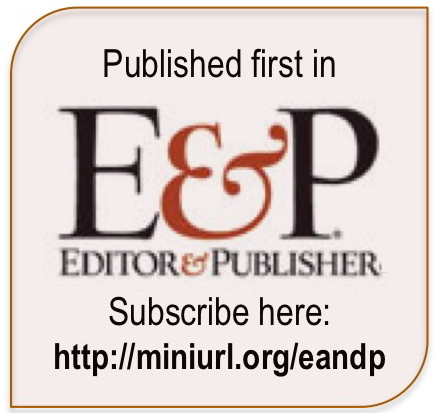 The nearly universal answer we have heard from editors and publishers is that they are going to transition from print to digital publishing. On the eve of the Thanksgiving weekend, the Newspaper Association of America quietly updated its website on Wednesday to report that print advertising revenues in the third quarter fell by 6.4% from the prior year to $4.5 billion, the lowest level for the period since 1982. To put the decline in perspective, $4.5 billion in 1982 dollars would be worth more than $10.3 billion today. On the plus side, the NAA, a publisher-funded trade organization, reported that digital revenues advanced by 3.6% in the third quarter to a bit under $759 million. But the $23.5 million year-to-year gain in digital sales was too small to offset the $311 million year-to-year drop in print revenues. Thus, newspapers in the quarter lost more than $13 in print revenue for every $1 they gained in digital sales. After peaking at an all-time high in 2005, print ad sales at newspapers began what would prove to be a six-year dive in the middle of the next year, falling by 2.6% in to $11.2 billion in the third quarter of 2006. That means print sales in the third quarter of this year were $6.6 billion lower than they were in the comparable period in 2006, reflecting a 59.5% decline. In the same six-year time frame, digital sales at newspapers rose 19% from $638 million to $759 million. With the $6.6 billion drop in print revenue dwarfing the $121 million increase in digital sales, newspapers between 2006 and today lost a staggering $55 in print revenue in the third quarter for every $1 in new digital dollars. 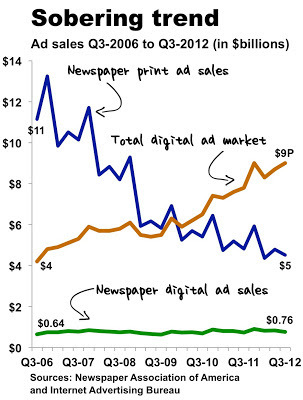 As illustrated in the green line along the bottom of the chart below, digital advertising growth at newspapers has been all but flat in the last six years at the same time the over-all market for digital advertising (orange line) has grown explosively. While the Internet Advertising Bureau has not yet reported digital sales for the third quarter of this year, I have projected from historic trends published by the trade association that the figure will come in at approximately $9 billion in the period. 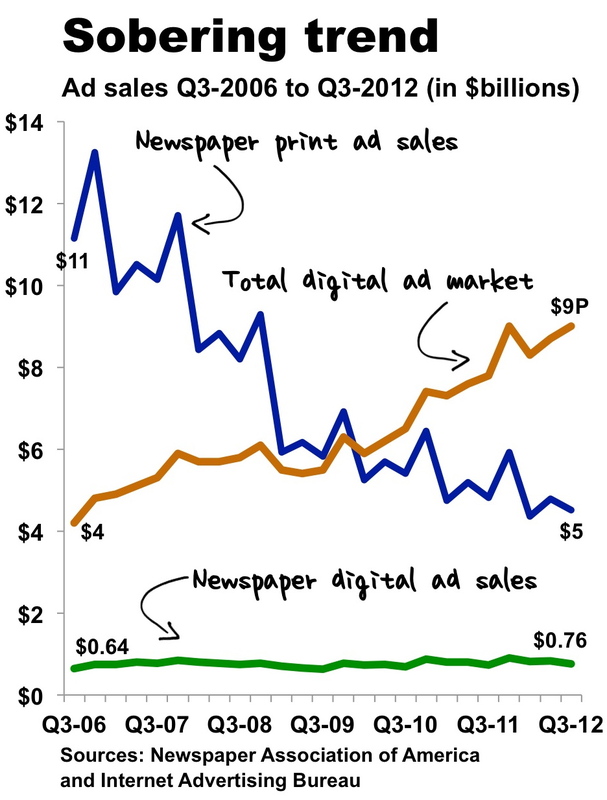 Assuming my projection is correct, then the over-all market for digital advertising between Q3-06 and Q3-12 grew by 114% while digital sales at newspapers increased by only 19% in the same period. One of the reasons newspapers are underperforming the market is that they have built their interactive businesses on the two weakest digital advertising categories: banner and classified advertising. As reported on page 21 of this IAB presentation, the percentage of digital ad dollars spent on banner advertising in the first half of the year has dropped annually for the last three years. The percentage of dollars spent on online classified advertising has tumbled by more than half since 2006. The single most significant digital ad category is search, which consistently has accounted for nearly half of all expenditures since 2008, according to IAB. Notwithstanding the growing desire of advertisers of all stripes to target specifically identifiable customers, transactional search is a format where newspapers never invested and never have been able to compete. By their inaction, publishers have been shut out of nearly half the digital market. Supporters of President Obama gasped prior to the election when four of the major newspapers in Iowa backed Mitt Romney for president in that crucial state. As it turns out, they needn’t have worried, with the President breezing to victory with 52% of the Hawkeye vote. But the endorsements penned by the Des Moines Register, Cedar Rapids Gazette, Quad-City Times and Sioux City Journal were far from the only ones in the country this election cycle that were out of step with voters in their states. 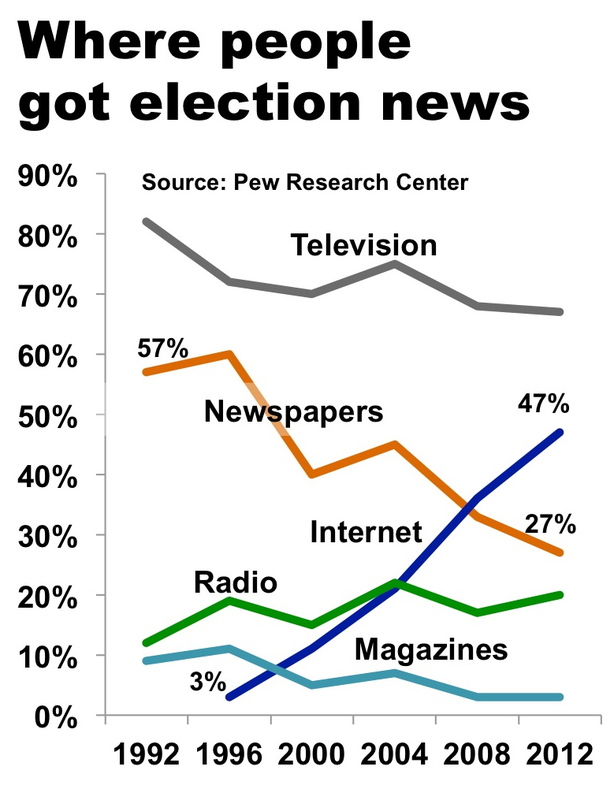 The disconnect was similar in a number of pivotal states, suggesting the waning power of newspaper endorsements – at least in this particular election – to sway the electorate in an age when readers have access to multiple digital and cable-news sources to shape their political views. In a rundown of swing-state endorsements, Poynter.Org found publisher-reader disconnects all over the place. Though final returns from Florida were pending at this writing, Romney evidently was narrowly defeated in spite of being endorsed by seven of the state’s dailies. He failed in Nevada, even though he was backed by two of the three biggest newspapers in the state. And he lost Ohio in spite of being pushed by the Cincinnati Enquirer and Columbus Dispatch, which serve two of the biggest blue counties in the must-win state. The disconnect was bipartisan. Romney captured North Carolina, even though Obama was favored by five dailies in the state, including such biggies as the Charlotte Observer, the Raleigh News & Observer and the Winston-Salem Journal. At the same time the recommendations of many newspapers diverged from the sentiments of the majority of voters in their states, a number of publishers skipped endorsing a presidential candidate altogether. Among the major publications declining to back a candidate this year were the Milwaukee Journal-Sentinel, the Virginia Pilot and the Palm Beach Post. Given the number of publishers whose endorsements failed to help their chosen candidate carry their states, is the decision not to endorse a presidential candidate the better part of valor? A non-endorsement policy might be good for a newspaper’s credibility, because it eliminates one of the potential arguments that its coverage is biased. And a gelded editorial page might be good for business, because an endorsement-free publication minimizes the chances of offending readers and advertisers. But a newspaper lacking the gumption to endorse a presidential candidate looks pretty lame in a day when opinions are a dime a dozen on the Internet and the airwaves. The only thing worse than a newspaper recusing itself in an election is a publication that finds itself zigging when its readers are zagging. The fact that so many newspapers were not on the same page as the majority of voters in several swing states in this election suggests they may be dangerously out of tune with the communities they serve. And the reason for this may be that newspapers tend to be published by and for older white people, an increasingly shrinking portion of the population and the electorate. 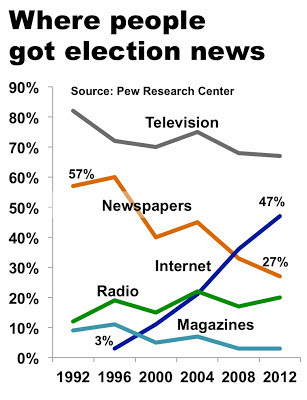 Without new products and services to appeal to next-generation voters, the relevance and influence of newspapers will continue to diminish, too. And that cannot possibly be good for business.